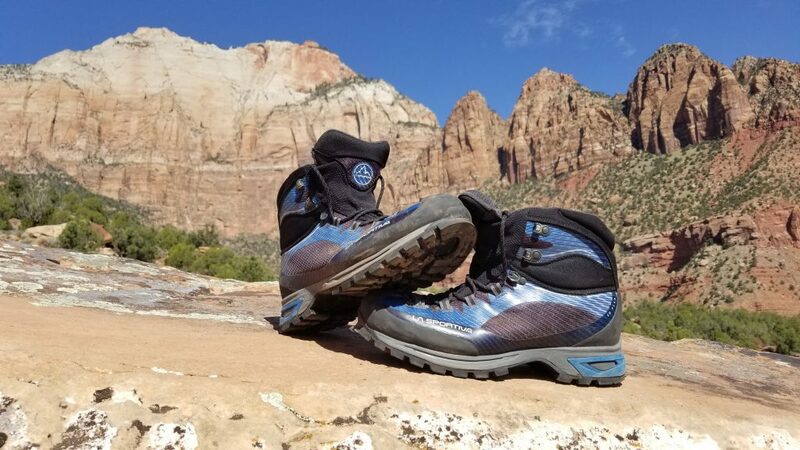 If the La Sportiva Trango TRK GTX boots could be described in one phrase, I would describe them as an all around go to boot for hiking, canyoneering, and backpacking (luckily this is all in my realm). 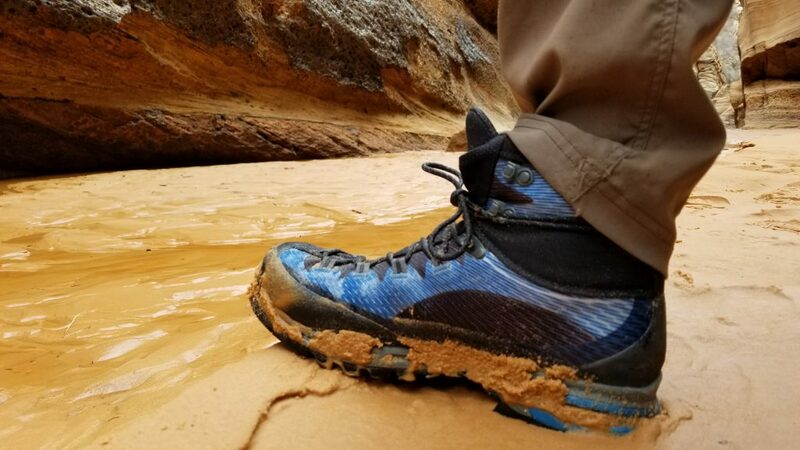 They are an all-around lightweight shoe that will work for anything from dry short days to long grueling wet days, and even multi-day trips with no perceptible difference in performance. 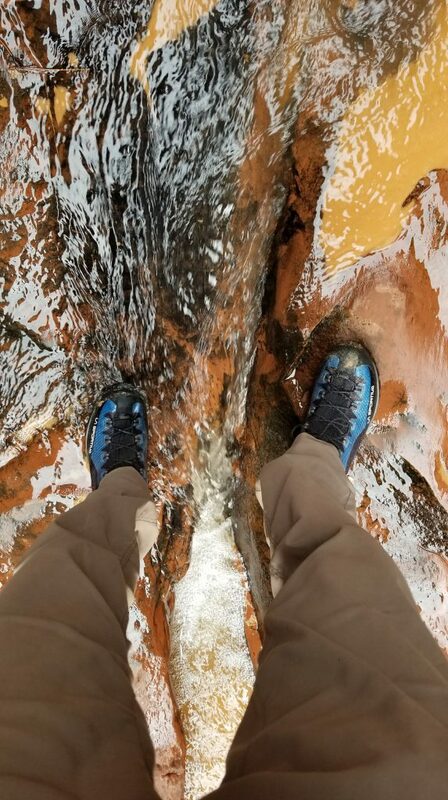 The full synthetic and waterproof upper makes the boots extremely light and comfortable even during stream crossings (or in my case, walking through flowing canyons). 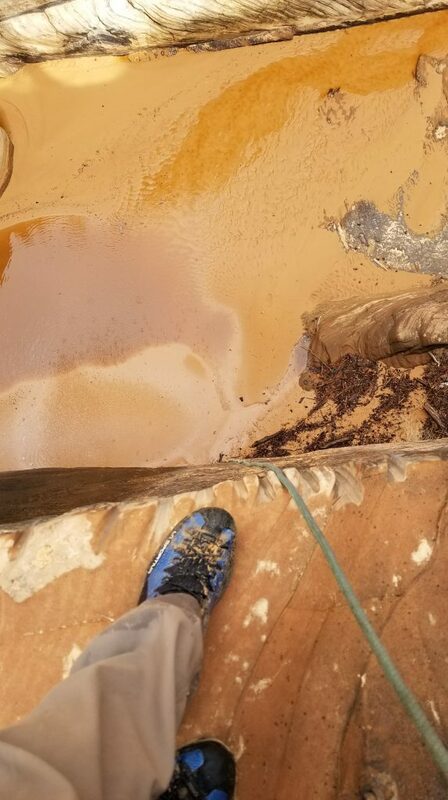 It seemed to me that there wasn’t any break-in time at all, the boots were comfortable from the beginning, and unlike my last pair of boots, I had no issues with hotspots or blisters no matter how long the day. 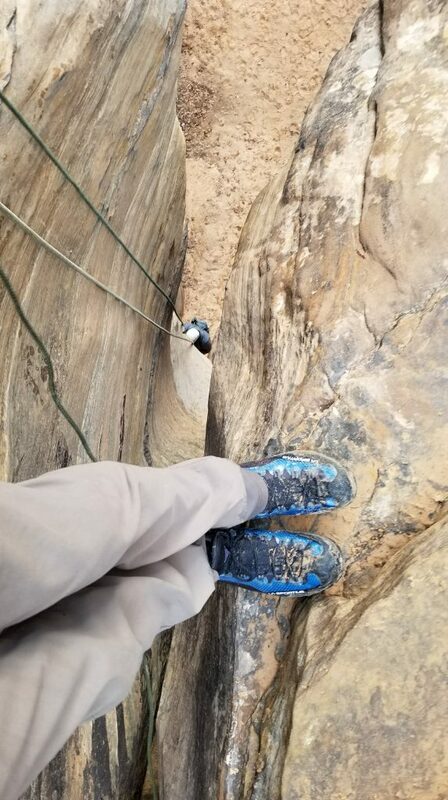 Since my job is guiding canyons in the Southwest Utah Desert I need a sticky rubber on my sole to navigate the sandstone slickrock and although the “Vibram Mulaz” sole on the Trango TRK GTX isn’t as sticky as the “Vibram Mega-Grip” sole on the La Sportiva TX3 it was still more than enough to feel comfortable navigating the exposed cliffs of Zion. I also loved that the Trango has a rubber toe and heel rand. This was especially helpful when stemming very narrow corridors where the only option is to use your toe. That little piece of rubber helped me stick to the wall a surprising amount! The boots keep your feet warm and dry through the cold and wet (Even trudging through the snow) and still seemed to breathe and keep your feet from overheating during warmer weather. The boot is very durable, I put 6-10 miles a day for a month of guiding/hiking and there seems to be very little visible wear. Rubber heel and toe rand. Even though it’s a personal preference; I’m not a fan of the look of the boot and even though it has withstood the test of time and use the boots have a “cheap” look. Overall I am extremely happy with the La Sportiva Trango TRK GTX. The boot has performed better than I could have ever expected and especially well for a high top boot in this environment where a normal approach shoe is typically used over anything else. La Sportiva has truly created a unique and incredibly usable boot. The extremely good mix between comfort and usability has quickly moved this boot to the top of my “must have gear list” and I would highly recommend it to anyone who would listen. 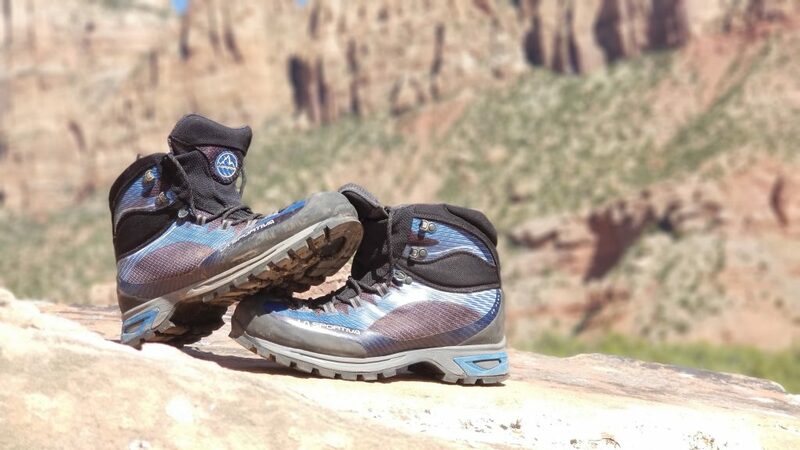 Between the Trango TRK GTX and the TX3 approach shoe; La Sportiva has gained a satisfied lifelong customer. Shop the La Sportiva Trango TRK GTX on Outdoor Prolink. Not a member? Apply today! 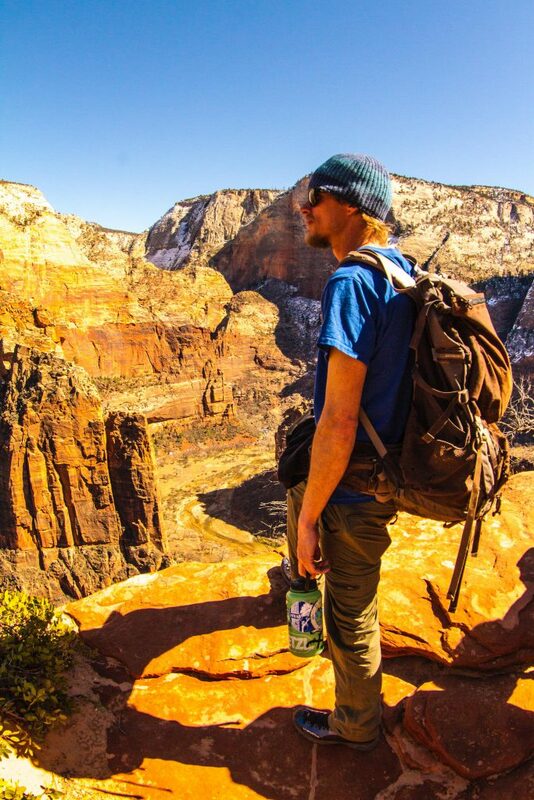 Joshua Durum is a hiking, canyoneering, and climbing guide at Zion Rock Mountain Guides in Utah. 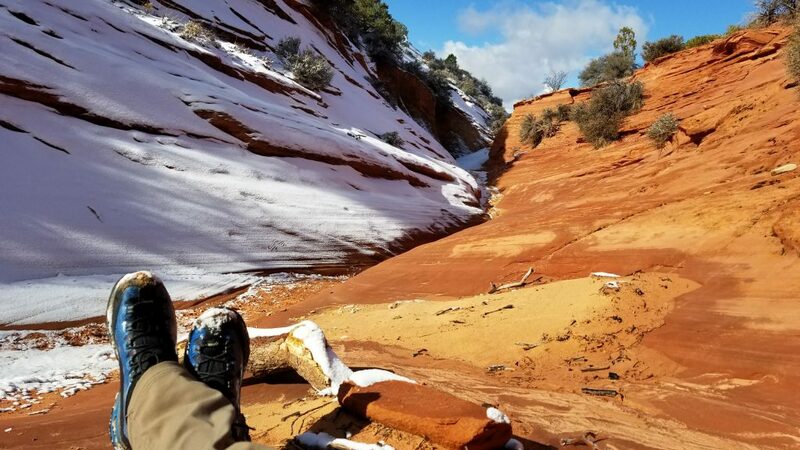 He fell in love with canyoneering immediately after moving to Utah from Louisiana. Being what seemed to be a completely different universe he dove deep into the world of Canyoneering. His first experience was going through a small slot in Zion National Park called “Keyhole Canyon”. After that, as you can imagine, he was hooked and has since explored over 10 unique canyons in the park (most more than a few times). Guiding has opened his eyes to the forgotten canyons outside of the park, and now he gets to live his dream! Find him on Instagram @giraffe_goat.